The WECO same day shipping guarantee applies to “Ready to Ship, In-Stock” items ordered online by 4:00 pm (Monday – Friday) Pacific time. You must also select low-cost UPS Ground, FedEx Home Delivery or an expedited shipping method. Shipments through the US postal service (USPS) are not included in the guarantee. Any order placed after 4:00 pm will be shipped the next business day. Free shipping is available on most orders totaling $100 or more and is offered when shipping to locations within the contiguous (lower 48) United States. You must select the ECONOMY option for free shipping. Economy orders arrive within 7-14 days. 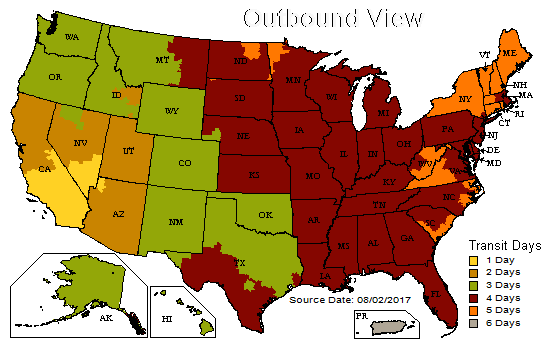 For deliveries in the continental US, orders are shipped by UPS, FedEx or USPS. Our discounted shipping rates are calculated on package weight and destination. Ground Commercial Mon-Fri 4:00 pm Same Day* 1-5 Business Days** Delivered Mon-Fri by end of business. Notes: All times displayed are in Pacific time. Business days are considered Monday - Friday, and do not include Federal holidays. *In-stock items only **See the Transit Map below for estimated delivery times. We use either air or ground shipping to ensure delivery within the promised time frame. Local pick-up of your order is available for a special handling fee of $4.95 per order. Local pick-up orders require a minimum 1-hour lead time; orders received after 4pm Monday through Friday or after 1pm on Saturdays will be available at 10am on the next business day. After your order is picked from our warehouse, it is considered “complete” and your credit card will be charged. We will send an email notifying you that your order is ready for pick up. A 15% restocking fee will be charged for order cancellations or orders left for over 30 days. We are open M-F 8am to 6pm, Sat 8am to 4pm Shipping Estimates are available from the first page of the shopping cart. Simply enter your zip code, , and click “estimate shipping” to get an estimate based on the items in your cart and the destination zip code. Estimates will be shown for all available shipping methods. We are required by law to collect sales tax in the State of California. During the checkout process, you’ll be able to view the exact shipping cost for each method and estimated delivery time. Select the best shipping option for your delivery. Ground Shipping (Residential): Delivery to residential addresses Tuesday-Saturday between 9am – 8pm, 1-5 business day transit time. Ground Shipping (Commercial): Delivery to business addresses Monday-Friday during business hours, 1-5 business day transit time. 3 Day Shipping: Delivery in 3 business days by 4:30pm to most areas (8pm to residences). 2 Day Shipping AM: 2nd-business-day delivery by 4:30pm to most areas (8pm to residences). Next-business-day delivery between 8-10am. By special request only. US Mail, Free, Economy, Promo 7-14 day shipping via UPS/FedEx or USPS. This expedited service is available to a business addresses for a $15 fee. Please call customer service to request this option. We will send an email with your tracking number as soon as it ships. You can track the status of your delivery by clicking the “Order Status” link in the confirmation email, or from our Order Status page (no login is required). Next Day/2nd Day orders will be notified of backorder the same day. Ground orders will be notified by email within 1 business day if an item on your order is out of stock. Orders that qualify for WECO promotional Free Shipping rates will be shipped by the most cost effective carrier. Be aware that transit times can be 7-14 business days. Be sure to note your order with a PO Box if you cannot receive UPS deliveries. If Ground Shipping is offered, you may select this option to upgrade your shipping. Oversize/overweight charges may apply to some items. Certain very large or heavy items are not eligible for Free Shipping. 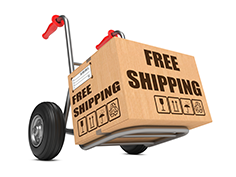 Note that some products are excluded from Promotional Free Shipping (Orders over $100). Additional charges may apply to oversized items such as storage tanks, UV systems, and water coolers. These charges will be calculated at checkout and will be included in the shipping rates. Orders weighing over 150 lbs will be offered freight shipping. Freight shipments arrive by truck and require a loading dock. If the delivery address does not have a loading dock, select the “Freight w/ Lift Gate Service” option at checkout. The freight estimates shown at checkout are our best estimate but additional charges may apply for limited access addresses. All freight quotes are for business to business delivery and may change if your address is classified to be a limited access area. Limited access is classified as the following: churches, colleges, construction sites, military base/installations, prisons, schools, residential, universities, rural locations and farms. A "Metro Delivery Fee" may apply in certain, large cities. We offer a drop shipping service with a blind-label option for a nominal fee. This will protect you from your customer receiving the standard receipt with pricing from WECO. Contact us about blind label drop shipments. Ship to a commercial/business address whenever possible. Purchase in bulk to save on repeat shipping costs, lower “per pound” shipping costs, and qualify for quantity discounts. Ship to city, instead of rural address. WECO is not responsible for lost or stolen orders if signature service is not requested. Signature service is free to commercial addresses. Subject to the Tariff/Terms and Conditions of Service, UPS guarantees on-schedule delivery of packages, shipped via UPS's services, that are listed as guaranteed, or will refund your transportation charges. Guaranteed Service is not available in all areas and does not apply to shipments containing a package with an Additional Handling or Large Package surcharge. Scheduled business days and delivery schedules are revised occasionally due to changes in distribution and volume, especially during holiday periods. Service to some remote areas also may require additional delivery days. For current delivery schedules, service availability and information, and a description of the UPS service Guarantee, see the UPS Rate and Service Guide. The most up-to-date transit time details will be available at ups.com/ctc at the time of shipping. Certain commodities and high value shipments may require additional transit time for customs clearance.